In my intro post I indicated that I have been in the process of accumulating supplies to do my boat. I have been in research mode for the last several months and have not previously removed oxidation nor performed a boat detailing project, overall my boat is 29 feet. Now that I have 2.5 days into the job here are some preliminary results and thoughts. 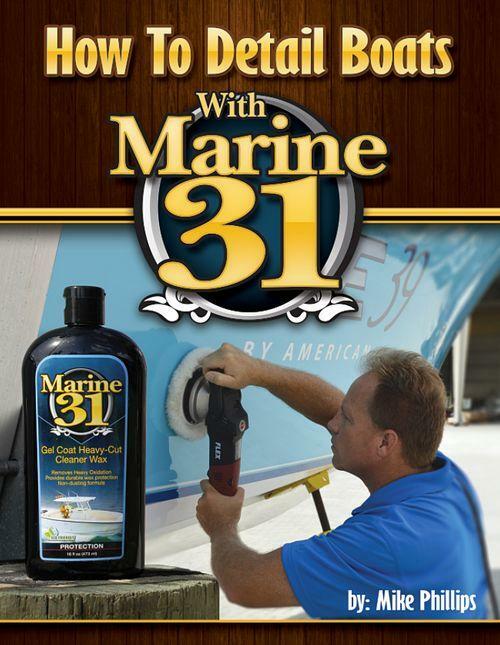 · I found the Marine 31 Gel Coat Heavy-Cut Oxidation Cleaner followed by Marine 31 Gel Coat Final Step Polish to be very effective. I have the 16 oz. bottles of each and it appears I will be able to do the whole boat with these quantities. · Mike indicated in my intro post that the DeWalt machine is a beast. I think I understand what he means between the weight of the machine and the power. Great machine and it is certainly up to the task. Doing small sections at a time allows relief for the fatigue. · There were some places I had to really lean into the machine to get through some difficult oxidation and in those cases it took 2 or 3 complete runs. Interestingly, I found the wool cutting and polishing pads to be more effective than the foam Lake Country pads. Not saying the foam pads are not good, wool seemed to make the job a whole lot easier. · I have a 12ft x 40ft boat garage to work in this was immensely helpful to be able to see the oxidation and then the results. This provided the continual feedback to see that I was making good progress and to keep me motivated to continue. Also I treated this as a job, I got up each morning and traveled to where I keep my boat on Lake Texoma. I packed a lunch, plenty of water, some snacks and of course my dog Lexi an American Water Spaniel who enjoys the truck ride and hanging out with me all day. · Working on a ladder to reach the top part of the boat was slow going. I wonder what others have done to make this process go faster. In my case I don’t have a lot of extra room on either side of the boat in the garage even with the boat parked close to the wall on the side I am not working on. Pro suggestions to make the ladder work go faster or some type of scaffolding? · Working small sections at a time with tape as a visual guide to stay in the area proved to be very helpful and not get “lost” in where I was working. · As I got to the second side of the boat I could tell I was moving faster and developed some process improvements in my techniques. · Having purchased and read Mike’s book ahead of time provided additional confidence for me. I was starting with a level of knowledge that prepared me to start the job with confidence. · Overall I am extremely satisfied with the Marine 31 products and quality. The Marine 31 website, product descriptions and book provided an authoritative source of information to enable me to learn the knowledge to do this job myself. I finished the job and was able to get to a consistent finish new pictures are attached although it is cloudy. I hand waxed with Marine 31 Gel Coat Carnauba Wax + Sealant. What is recommendation for the next wax job to prevent having to go through all of this again? Reading about the Marine 31 Captain’s Boat Coating with UV50, it appears it would be the best choice. Looks great in the pictures. Nice work. What is recommendation for the next wax job to prevent having to go through all of this again? Reading about the Marine 31 Captain’s Boat Coating with UV50, it appears it would be the best choice. The Captains Boat Coating will defiantly outlast a wax or sealant but in order to apply it you have to remove any previously applied wax, sealant or polishing oils from the compounds and polishes. For this reason, the best way to go is to apply the coating after compounding and polishing. You can strip the polishing oils off using an APC or a dedicated surface prep product as there are now a few on the market. Also you can use Mineral Spirits, a diluted version of IPA or Prep-Sol. You could even wash the boat with a detergent wash like Dawn dishwashing soap. The big picture is to remove any polishing oils left behind from the compounding and polishing steps so they don't interfere with the bonding of the coating to the gel-coat. Now that you've waxed it, if you want to switch over to a coating you'll have to remove the wax and the way to do this best to ensure it's 100% removed is to re-polish the boat and then chemically strip the gel-coat. You probably don't want to hear this but I cover all of this in my how-to book. Thanks Mike for the additional info. I had not read that section of the book yet but now will go back and review. I am very happy with the guidance in the book to get this point. It made a huge difference in the appearance of the vessel. I found it a real challenge to write this book. One thing about writing any "how-to" book is when you publish it you also are putting it out on the world market for peer review. It could happen, I'm only human but I take great care to make sure everything I write is accurate and works in the real world.